Muscle Activation Technique Plano: Is Aerobic Training Harmful? 2017 is here and like all the years before, the cardio/aerobic equipment is being used to its max potential once again for people trying to shed those unwanted pounds from years past. This, of course, not only happens in Plano, but in Dallas and America as a whole! Throughout my education process, I have learned of all the benefits that come with cardiovascular training. It seems as though it is the one thing that has no harmful effects in the exercise world. I have come across an article from Charles Poliquin that might make us be less inclined to just rely on the treadmill and bike for our health and weight loss goals. The article states that there was a test done that showed endurance athletes had elevated cortisol levels when compared to non-endurance athletes. This is important because elevated levels of cortisol can cause your body to add on fat instead of shedding it off. The key area that fat will be added is the visceral area of the body which is where our most important organs are located. This increase in fat around our organs makes our heart, brain, gastrointestinal tract, and reproductive organs work harder which in turn can speed up the aging process. Aerobic training was also found to increase the body’s levels of inflammation. The article referred to inflammation as “the secret killer” in our culture. Chronic inflammation has been linked to major health issues that age tissues and cause fat gain, heart disease, insulin resistance and diabetes, asthma, arthritis, cancer, poor reproductive health, and stomach problems. 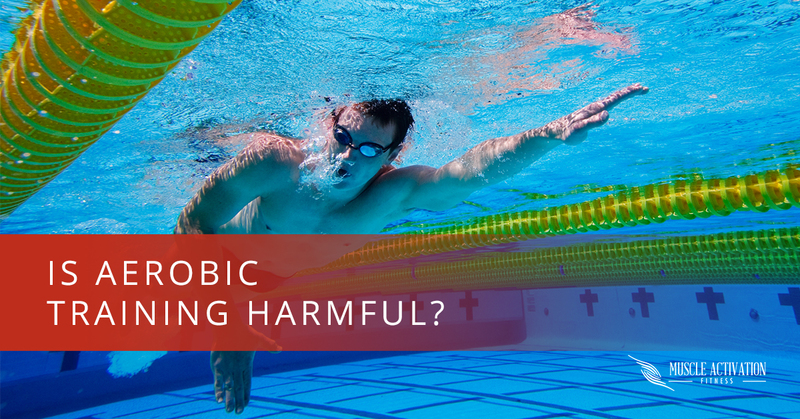 The article did show that some of the inflammatory responses did decrease when aerobic athletes supplemented with a probiotic and antioxidants. I was shocked to find out that aerobic exercise was also found to decrease the immune system function, which would put people a greater risk of infection (especially upper respiratory). A study found that the immune system was most damaged with continuous aerobic training (90 min) at moderate to high intensity (60-80% max O2 consumption). There were other negative effects listed in the article, but these were the ones that I was most intrigued by and wanted to share. Just like any other type of exercise out there, aerobic training is not a magic pill that accomplishes everything. A good training program for general health should have a variety of exercise strategies built into the program. Our choice of exercise should be determined by our goals. I think it is a possibility that people have been frustrated at not attaining their goals because they are using the wrong tools to get there. At Muscle Activation Fitness in Plano, we believe our bodies are amazing machines that adapt very specifically to what they are asked to do. Make sure that the type of exercise you are putting your time and effort into are actually going to get you to your goals.